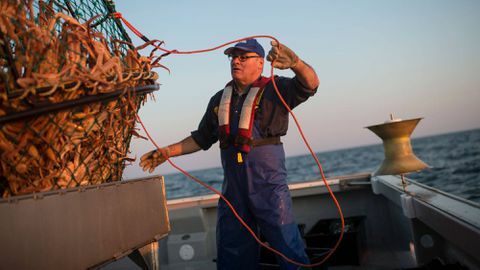 Crab harvester Andre Bourgeois untangles a rope while unloading a trap on July 14. Available workers’ compensation numbers show about 350 Canadians die each year from an on-the-job injury at work, with forestry and fishery having the highest fatality rates among all industries. Statistics Canada will explore collecting more robust data on worker fatalities and injuries in the country, which advocates had recommended as a key first step in improving worker-safety policies. The statement from the office of the Minister of Innovation, Science and Economic Development comes after a recent Globe and Mail project detailed how Canada differs from peer countries such as the United States, Australia and Britain in that it doesn't produce detailed, national, publicly available information on the risks facing workers. As a result, it's difficult to answer basic questions on which jobs are getting safer or more dangerous over time, and whether prevention efforts are effective. "Statistics Canada is prepared to explore collection of data from the provincial and territorial ministries of labour and the workers' compensation boards" in partnership with Employment and Social Development Canada and other stakeholders, the office of Innovation Minister Navdeep Bains said. This "would ensure a complete and integrated portrait of work-related accidents, injuries and fatalities in order to address the specific data needs on the important issue of worker safety." Currently, responsibility for workers' compensation and occupational health and safety issues falls largely to provinces or territories – and each jurisdiction has different approaches in capturing data. As a result, there's an "uneven landscape" of health and safety research capacity, said Barbara Neis, co-founder and senior research associate at the SafetyNet Centre for Occupational Health and Safety Research at Memorial University. The last time Statistics Canada produced a national analysis was in 1996. Responsibility for fatality and injury counts, which are based on accepted workers' compensation claims, shifted over to the Association of Workers' Compensation Boards at that time. Detailed data must be purchased, and researchers say these counts don't represent the whole work force, partly because not all sectors or types of workers are included in the workers' compensation system. Available workers' compensation numbers show about 350 Canadians die each year from an on-the-job injury at work. If longer-term work-related illnesses (such as mesothelioma from asbestos exposures, or lung cancers from silica dust) are factored in, this number climbs to about 1,000 deaths a year. National fatality rates – which show proportionately where risks are the greatest – are not produced in Canada. The Globe sought to fill that data gap by calculating these rates (using workers' compensation accepted death claims and Statscan employee counts) to establish what the most deadly jobs and industries in Canada are. This effort, in conjunction with Statistics Canada, found that fishing and forestry have the highest fatality rates of any industry. Katherine Lippel, Canada research chair on occupational health and safety law at the University of Ottawa's law faculty, said it is "extremely important" to be able to monitor worker fatalities and injuries nationally. She says better visibility on the true extent of workplace deaths and injuries is a "public-health issue." The NDP's labour critic Sheri Benson raised the issue during Question Period last week in the House of Commons. "If we don't have the data and don't have the evidence, how do we even know what we're doing is having the intended consequences, that it's actually making a difference?" Ms. Benson said in a separate interview. The office of Employment Minister Patty Hajdu said she was not available for an interview. Mr. Bains's office said he was not available for an interview, and instead e-mailed a statement. It did not respond to follow-up questions. In his mandate letter from Prime Minister Justin Trudeau, Mr. Bains was asked to "improve the quality of publicly available data in Canada." Statscan told The Globe that it is feasible to resume publishing data on worker fatality rates. "Producing worker fatality rates is doable," the agency said, adding that, "at this point, additional funding would be required to produce such analyses on fatality rates." Broadly, the agency said it is "prepared to work in partnership with all stakeholders to evaluate the interest of producing the information and explore data-sharing agreements to provide a complete and integrated portrait of work-related accidents, injuries and fatalities in order to address the specific data needs on worker safety." Catherine Trask, president of the Canadian Association for Research on Work and Health, says improving data quality is a sound investment. "Investments in prevention have an excellent return on investment – so if we can prevent injuries and fatalities from ever happening, the savings in terms of health-care dollars and lost productivity are substantial," Dr. Trask said. "If you can't monitor and people don't have a clear sense of where the most hazardous situations are, then it doesn't become a prevention priority," Dr. Neis said. Luke Perry was killed in a workplace accident at a construction site. His mother, Patti, now helps other families affected by workplace accidents and advocates for safer workplaces.